Special Orders (オーダー, Orders) is a mode in Super Smash Bros. for Wii U. It has two submodes: Master Orders (マスターサイド, Master Side) and Crazy Orders (クレイジーサイド, Crazy Side). In it, the player must undertake orders given to them by either Master Hand or Crazy Hand. In order to play these orders, one must use gold earned by playing the game. A Master Orders selection screen. Master Orders is the first kind of Special Order. In this mode, players must complete one of three orders presented to get a prize. Master Orders range in difficulty, and the cost to attempt the order and the prize earned for completing the order is dependent on its difficulty level. These orders are often battles with special rules, which can vary between a 1-minute timed battle, a 2-minute stock battle, a 1-minute coin battle, a stamina battle, and a horde battle. Additional effects, such as characters being able to reflect projectiles, or starting equipped with certain items, may also be present. Easier tickets may give effects that favor the player, while the harder tickets may give effects that either favor the opponents, hinder the player, or both. Likewise, the difficulty level of the ticket will affect the difficulty of the opponents. Tickets that have a hammer icon present signify that items will appear during the match. Sometimes an order will be a Stadium mode that requires the player to achieve a certain score, such as hitting Sandbag a certain distance in Home-Run Contest, or scoring a certain amount of points in Target Blast. No matter which Master Order the player chooses, and regardless of whether they win or lose, a new set of three options will be presented for the next challenge (there is no way to play the same order twice). Rewards for clearing an order can vary from getting some gold, a custom part, a CD, or even a Crazy Orders Pass. If the reward is a custom part, a series symbol will be displayed right next to the reward; this lets the player know that the reward, whether it is equipment or a custom special, is compatible with at least one fighter from that selected series. Sometimes the player will receive more than one custom part, but the extra custom parts are usually completely random, or are affiliated with the character that the player was using. Also, the extra custom parts will always be of the same category as the primary reward; if the primary reward is equipment, all extra custom parts will be equipment as well. 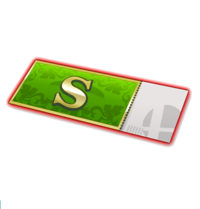 If the reward's series symbol is the Super Smash Bros. symbol, then the player has a chance of receiving a custom outfit part, or a custom headgear part upon clearing the ticket. In terms of ticket prices, Easy tickets cost 50G, Normal tickets cost 100G, Hard tickets cost 200G, Very Hard tickets cost 500G, and Intense tickets cost 1000G. A Crazy Orders selection screen. Crazy Orders is the second kind of Special Order. In Crazy Orders, rather than having one single order, the player attempts a series of orders until they either lose or claim victory. Crazy Orders are notable in that they require 5000 gold or a special pass to initiate (neither are refundable after accepting), after which individual orders are free to attempt. The passes are obtainable as rewards for Classic Mode, Smash Tour, Master Orders, or Event Mode. The player can then attempt as many orders as they can complete within a 10 minute time limit. These orders are battles similar to those found in Classic Mode, such as Free For All, Team, Giant, Horde, or Metal Battle. For each consecutive order, the orders become harder, and the player retains the same time limit from the previous order. At the end of every order, 33% of the player's current damage will be healed. When the player wants to stop, they will face off against Crazy Hand in a battle with no time limit. In this battle, both the player and Crazy Hand will have stamina, with the player's stamina being 150 HP plus the amount of damage they would otherwise currently have (thus they will have higher HP if they have accumulated more damage during the final order). Crazy Hand's HP will increase the more orders the player has completed, up to a maximum of 300 HP. If the difficulty is high enough (after playing many rounds), one or more extra opponents will be accompanying Crazy Hand (opponents start appearing at turn 6); one of these extra opponents can even end up being Master Hand if the player manages to reach turn 14. Kirby with 150 HP, the bare minimum. When damaging Crazy Hand or Master Hand, they will sometimes drop a chest containing a trophy that the player can pick up; the number of chests dropped increases with the number of rounds cleared. Said chests will despawn after a while. If the player manages to defeat Crazy Hand, they get to keep everything earned during the run, and may also earn bonus awards based on which enemy fighter they KO'd most often. If the player is defeated at any time during Crazy Orders or if time runs out, a portion of their rewards will be lost. Crazy Orders typically have better rewards than Master Orders due to their higher risk. Clearing a Master Orders ticket of Hard difficulty or higher will have the player challenge Dr. Mario where beating him will unlock him. Clearing a Master Orders ticket of any difficulty for the first time will reward a Crazy Orders Pass. Clearing a Master Orders ticket while playing as Rosalina & Luma will unlock the Rosalina in the Observatory / Luma's Theme music. Clearing a Master Orders ticket while playing as Mega Man will unlock the Tornado Hold custom move for him. Clearing a Master Orders ticket of Very Hard difficulty or higher will unlock the Trade-Off Attacker Protection Badge equipment. This challenge is immune to the Golden Hammer. Clearing a Master Orders ticket of Hard difficulty or higher while playing as King Dedede will unlock the King Dedede's Theme music. Clearing a Master Orders ticket of Intense difficulty will unlock the Desperate Specialist Agility Badge equipment. Clearing Crazy Orders after 8 rounds will have the player challenge R.O.B. where beating him will unlock him. Clearing Crazy Orders will unlock the Crazy Hand trophy. Clearing Crazy Orders while playing as Villager will unlock the Rover trophy. Clearing Crazy Orders after 5 rounds will unlock the Speed Crasher Agility Badge equipment. Clearing Crazy Orders after 10 rounds while playing as Greninja will unlock the Battle! (Reshiram/Zekrom) music. Clearing Crazy Orders after 12 rounds will unlock the Soda Popinski trophy. Clearing Crazy Orders after 20 rounds while playing as Mario will unlock the F.L.U.D.D. trophy. The Home-Run Contest and Target Blast tickets used to allow equipment. However, it started to disable equipment when Roy was released. Custom moves are unaffected. If a team battle ends in Sudden Death, and the player is KO'd while the partner survives, it ends as a Failure anyway, removing any chance of the partner defeating the remaining foes. In Master Orders, the cursor over the tickets is the right hand, while the cursor in Crazy Orders is the left hand to represent the host of each order type. If a match ends in a tie and the player is not 1st place, Sudden Death will be skipped, resulting in 2 or more CPUs in 1st place. In the Crazy Orders final battle, equipment that grants items will work as normal. It is the game's only boss fight with this property. This page was last edited on March 21, 2019, at 14:05.